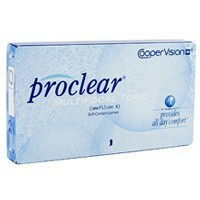 Proclear Multifocal Toric Disposable Contact Lenses from Cooper Vision. Proclear Multifocal Toric contact lenses are the only monthly replacement lens designed to address both astigmatism and Presbyopia – a condition caused by aging eyes resulting in difficulty reading small type and seeing objects up close. Only Proclear Multifocal Toric contact lenses combine a superior lens design, Balanced Progressive™ Technology, with a unique lens material made using our patented PC Technology™. The result is lenses that give you great vision at every distance while staying moist and comfortable, all day long. These multifocal toric lenses focus light from both near and far distances to the back of the eye, creating a clear image. This unique system uses two different, yet complementary contact lenses that work together to provide clear vision near, far and in between.